A moment of destiny – Charlie is about to discover “the Kid,” Buster is poised to grab a passing car. 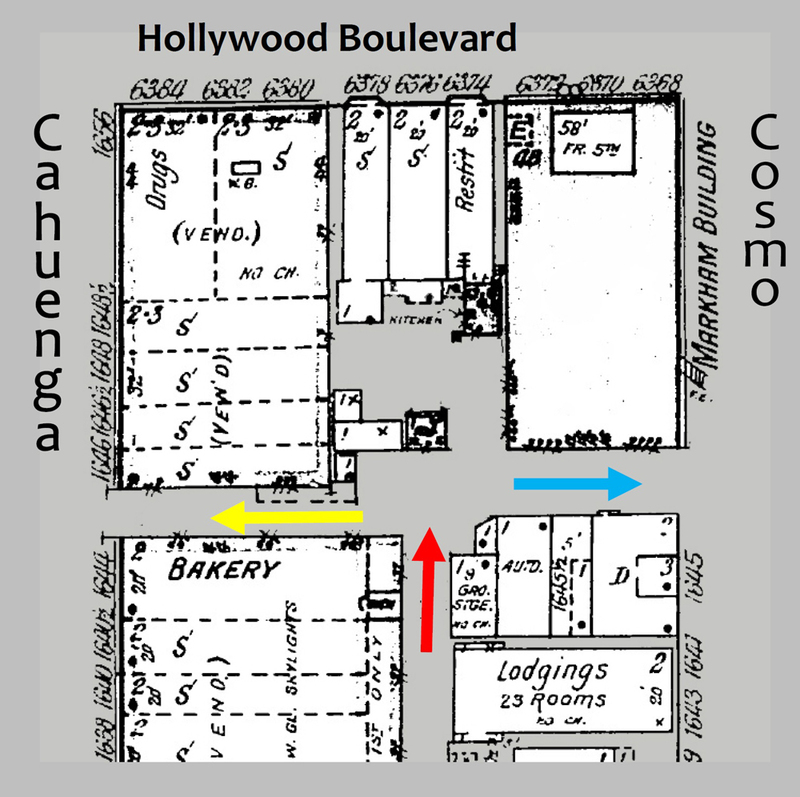 Behind them – the back and front of the same building, once a bakery, located at 1644 N. Cahuenga, in Hollywood. 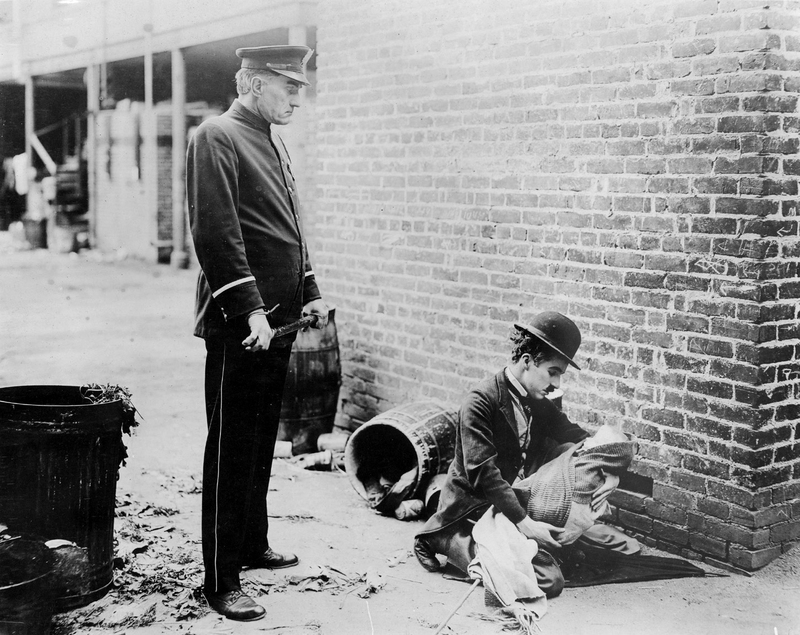 Charlie Chaplin encountered the abandoned infant who will become his son in The Kid (1921) along an alley running east-west between Cosmo and Cahuenga just south of and parallel to Hollywood Boulevard. 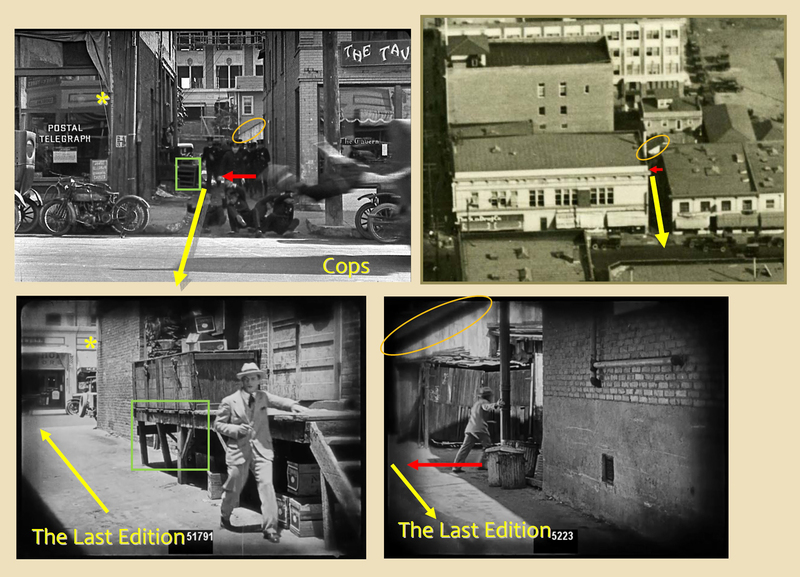 A gang of police would later chase Buster Keaton down the same alley in Cops (1922), and Harold Lloyd and Bill Strother would later knock down policeman Noah Young there in Safety Last! (1923). The alley also appears in such films as Keaton’s 1920 short Neighbors, Lloyd’s 1921 short Never Weaken, and director Emory Johnson’s 1925 newspaper crime-drama The Last Edition. Note: the alley is now featured in the new Travel Channel show Time Traveling with Brian Unger (see end of post below). Click to enlarge. Looking west, the alley runs from Cosmo (blue) towards Cahuenga (yellow). The brick box to the right of Chaplin, upper left, was an oven for the building at 1644 Cahuenga, which was originally a bakery, built in 1905. The overhanging second floor is supported by posts. The Last Edition, a once-lost film restored by the San Francisco Silent Film Festival and EYE Institute Netherlands, was premiered at the 2013 Festival. Although set in San Francisco, with many identified SF locations, The Last Edition contains several scenes and pick-up shots that were actually filmed in Hollywood – a common practice with “location” movies, even today. Click to enlarge. Looking south down what Google Maps calls “East Cahuenga Alley.” Clarence Walker (left) portrays a crime-busting newspaper reporter. At right, Charlie attempts to return “the Kid” to a nurse maid whom he believes to have “dropped something.” The posts support the overhanging second floor. Click to enlarge. Upper left, Charlie runs north past a bakery brick oven. The two lower right images show the reverse sides of the same shed. Preservationist and San Francisco Silent Film Festival President Rob Byrne was instrumental in identifying and restoring The Last Edition, a heretofore forgotten film. After informing Rob that his movie shared some Hollywood real estate in common with Buster and Harold, Rob graciously provided me online access to the film. Looking east – the Palmer Building at back on Cosmo Street, home coincidentally, to The Hollywood Daily Citizen newspaper. At left, Harold is mistakenly locked in a laundry wagon, and fears being late for work. I thought some settings in The Last Edition looked familiar, and quickly realized that it provided the missing link in what I jokingly call the transitive property of film locations – that if A is filmed beside B, and B is filmed beside C, then A is filmed beside C.
Click to enlarge. The * marks a detail on the west side of Cahuenga and its east reflection in Cops. 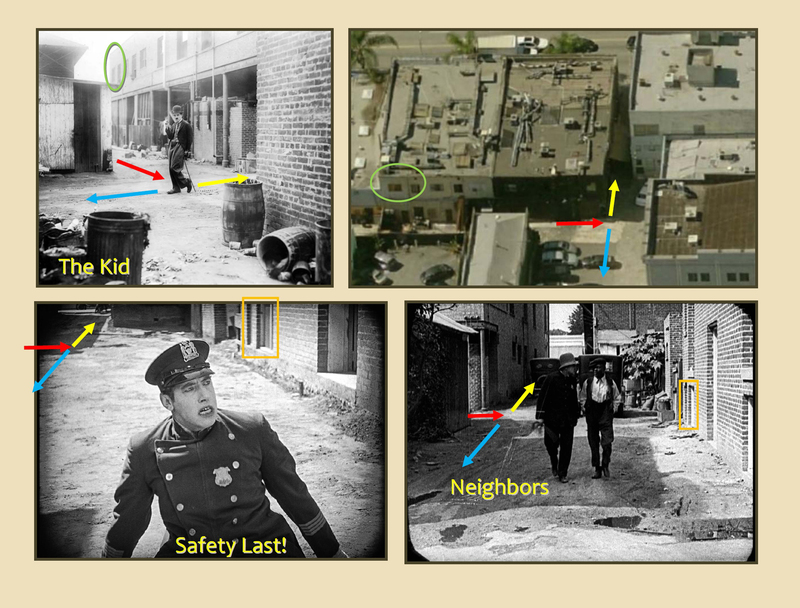 As I write at page 199 of my Chaplin film location book Silent Traces, I knew Charlie filmed his initial discovery of “the Kid” at the same setting where Buster had filmed scenes from Neighbors; the details in the background alleys match up. However, because both Chaplin and Keaton had filmed other scenes from these movies near Chinatown and Skid Row, I had always assumed the settings pictured here were in downtown Los Angeles as well. By providing unique views of the alley where Buster filmed Cops, and matching views of an alley appearing in Buster’s Neighbors, The Last Edition supplied the connecting link to show Chaplin filmed The Kid at this alley in Hollywood as well. 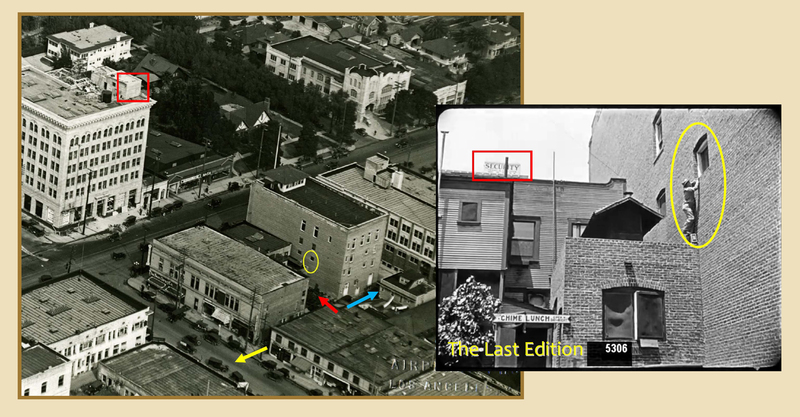 The 1919 Sanborn fire insurance map depicted here confirms that the back of the second floor of the former bakery at 1644 Cahuenga was supported on posts overhanging the first floor, which covered a brick oven at back (more clearly seen on the 1913 map), exactly matching the movie images from The Kid. Click to enlarge. Two views of the Markham Building, at left. Harold filmed here in 1921 before the Palmer Building at back on Cosmo was constructed. Click to enlarge. Looking west from Cosmo down the alley towards Cahuenga. At back you can still see the post supporting the second floor corner. Although now remodeled, the back of the Markham Building, which portrayed the De Vore department store in Safety Last!, stands to the right in each image. (C) 2013 Google. Looking SE down Cosmo at the Palmer Building. (C) 2013 Google. Looking NE up Cosmo – from Safety Last! I can think of no Hollywood exterior that plays a greater role in silent movie history than this unique alleyway. Not only did Chaplin, Keaton, AND Lloyd shoot here, but in each case it was to film a recognized masterpiece that would later be inducted into the National Film Registry. Amazingly, the rediscovery of a forgotten film brought all of the pieces together. Click to enlarge. Clarence Walker perches on tiptoe to eavesdrop on the crooks. The Last Edition contains a thrilling real-life stunt, as the reporter, played by Clarence Walker climbs up, down, and around the back of the wooden structures formerly standing at 6378-6374 Hollywood Boulevard in order to eavesdrop on the crime syndicate. As shown above, Clarence perched on an orange crate at the edge of the roof in order to reach up to the window of the room where the crooks were hatching their plan. 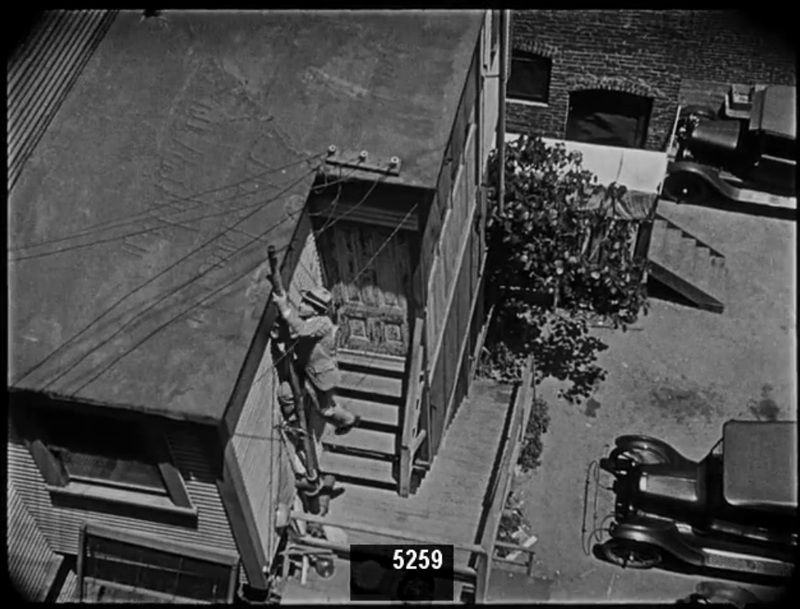 The creaky building Walker climbs was replaced with a modern structure in 1936, adding to the documentary value of this rare footage. 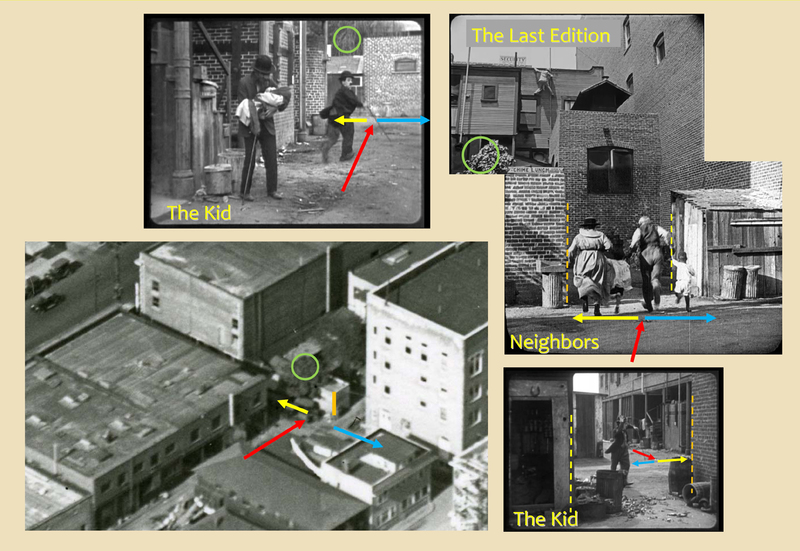 In closing, two historic alleys bookend the tale of The Kid; the alley where Charlie first discovers the abandoned infant, and the alley where Charlie and Jackie Coogan are reunited after the authorities try to steal Jackie away into an orphanage. Remarkably both of these alleys still exist, and may be visited today. You can read about Charlie and Jackie filming their emotional reunion at Olvera Street at this post here. Charlie and Jackie Coogan reunite on Olvera Street, today a popular Mexican marketplace and tourist attraction. The view looks south down Olvera toward the Plaza de Los Angeles. Chaplin filmed here in 1921, seven years before City Hall was completed in 1928, which towers at back of this circa 1930 photo. Chaplin filmed chase scenes from Easy Street (1917) at this same spot. PS – Below, yet another connection between The Last Edition and Buster Keaton’s Cops. Both contain scenes filmed at the Brunton Studio backlot north of Melrose, the future site to the Paramount lot. I wish to express my sincere thanks to Rob Byrne, the San Francisco Silent Film Festival, and EYE Film Institute Netherlands, for rescuing and restoring The Last Edition, and for their assistance with preparing this post. Note: the alley now appears in the new Travel Channel show Time Traveling with Brian Unger. Although they didn’t have time on the show to point out the Keaton and Lloyd connections, it is great to see this long lost historic filming location being recognized by the media. Leading a tour of the alley during the 2013 Cinecon Classic Film Festival – Brian Unger and guests on the Travel Channel show. The Last Edition EYE Film Institute Netherlands and the San Francisco Silent Film Festival. Cops and Neighbors licensed by Douris UK, Ltd.
Vintage aerial photographs HollywoodPhotographs.com. Contemporary aerial view (c) 2013 Microsoft Corporation, Pictometry Bird’s Eye (c) 2010 Pictometry International Corp.
A March 2011 view west from Cosmo of the common filming site. Note: time does not stand still. The alleyway at back was recently closed to vehicles to make room for outdoor dining, and the driveway on Cahuenga leading into the Cops alley is now blocked to traffic by a raised curb and pedestrian sidewalk. 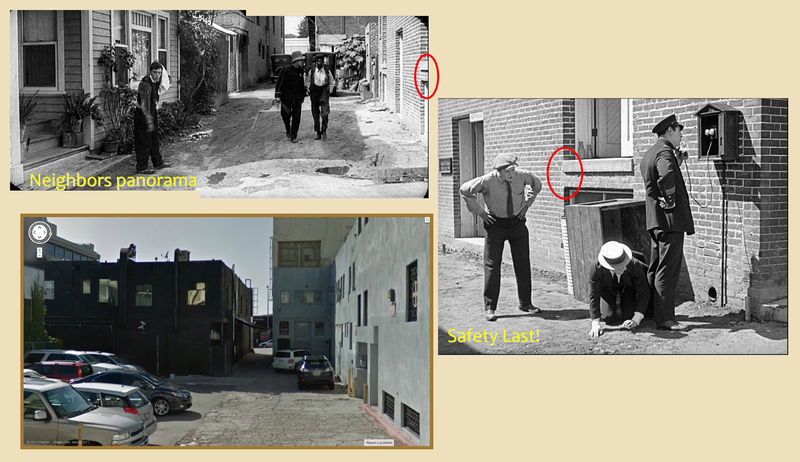 This entry was posted in Buster Keaton, Chaplin - Keaton - Lloyd Alley, Charlie Chaplin, Cops, Harold Lloyd, Hollywood Tour, Safety Last!, The Kid, The Last Edition and tagged Brian Unger, Buster Keaton, Chaplin Locations, Chaplin Tour, Charlie Chaplin, Cops, Harold Lloyd, Hollywood, Hollywood Tour, Keaton Locations, Safety Last!, Silent Comedies, Silent Movie Locations, Silent Movies, The Kid, then and now, Time Traveling with Brian Unger, Tramping Through Hollywood, Travel Channel. Bookmark the permalink. Not sure if you’ve been in the neighborhood lately. Here are some snaps. I was in LA last week and visited this alley, thanks to this great guide. Thanks. I stumbled on this post after watching Time Traveling with Brian Unger’s episode you mentioned above. After watching Chaplin (with Robert Downey Jr) as a teenager, I became quite interested in anything Charles Chaplin related, I’ve even had the luck of stumbling upon the now Jim Henson Studios in Hollywood. 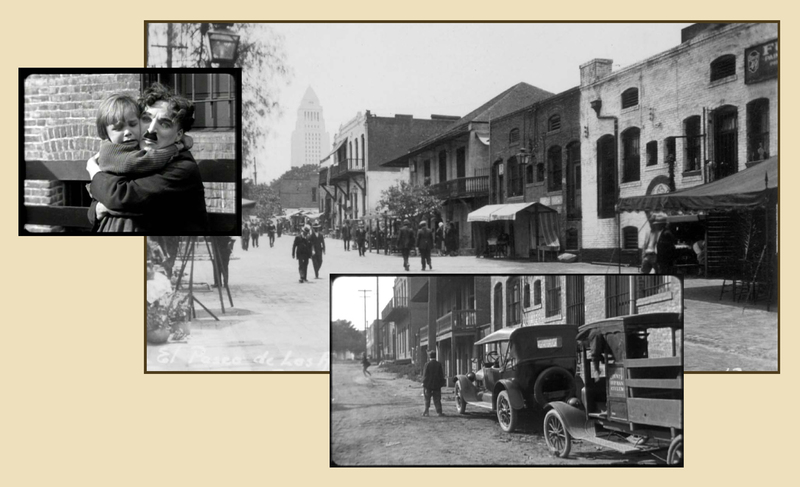 After watching the episode of Time Traveling, I decided to see if there were any tours in Hollywood centered around Charlie Chaplin “landmarks” which brought me to this wonderful blog! Thank you for sharing your knowledge, I look forward to using your Hollywood film locations guide the next time I find myself in Hollywood!